The A.I.F. No. 1 crew posing on Finals Day on the iconic Henley-on-Thames rowing course. In the small circle is the ‘Dinkum Aussie Flag” in front of Archie Robb in the bow seat. The inset shows the detail of the Southern Cross and Union Jack. 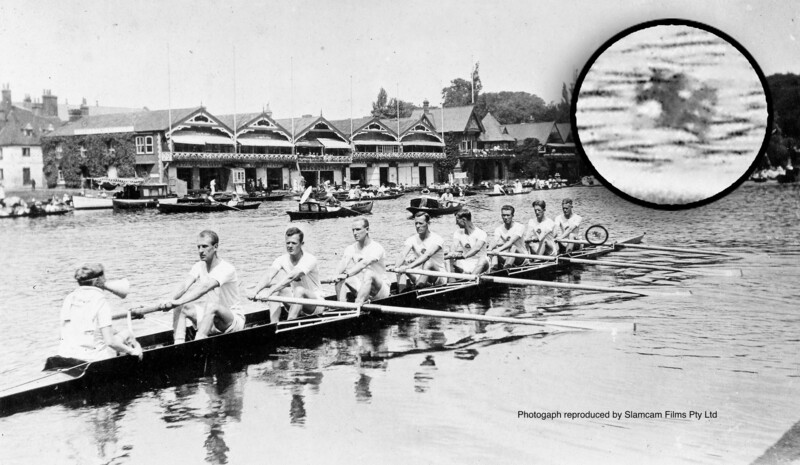 Scott Patterson of Slamcam Films, who is working on the documentary film The Oarsmen about the Australian eight who won the King’s Cup at the 1919 Peace Regatta, tells the story of a special Aussie flag. It’s funny how something can be staring you in the face, and it’s not till you are least expecting, it a clue emerges and then incontrovertible proof. I’ve been researching the story of the 1919 Royal Henley Peace Regatta for four years. We’re trying to produce a documentary, The Oarsmen that will do justice to this remarkable and unique sporting event. The research has involved (a lot) of on-line digital research of newspaper reports and accounts, the assistance of many overseas rowing ‘diehards’ in England such as Tim Koch, Greg Denieffe, Chris Dodd and Donald Leggat not to mention the valuable assistance of HRR. And in the United States with aid from Göran Buckhorn and Tom Weil amongst others. The story of the A.I.F. 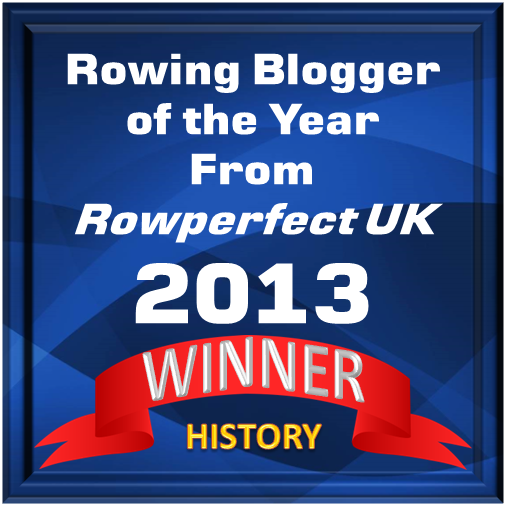 No.1 crew who won the King’s Cup is up there with some of the best stories about rowing. It’s Australia’s own ‘Boys in the Boat’, but I think more pertinent. From the Australian perspective, it’s a story about ‘diggers’ who rowed into war at Gallipoli and rowed out the other side at Henley. The story of the King’s Cup is about much more than a rowing race, in fact, rowing as a sport bookends the Australian experience in the Great War. Most importantly, it’s about survivors of the Great War that at the going down of the sun, age did weary and the years did condemn. There aren’t many trophies actually won by soldiers and heroes who passed on the mantle for others to share and treasure for one hundred years. The aim in my research is to find as many primary pieces of history as I can. It’s involved going down a lot of digital rabbit holes that eventually lead to a person, a face, personal letters, photos and mementoes. I’ve met descendants of nearly all the A.I.F. No. 1 crew members and found the human side and family perspective of the original crew members. That’s the best part, when pieces come together and you build a picture of people who are more than just race records or statistics, or names in a regatta programme, or frankly, just plumb forgotten. I tracked down one particular descendant of the A.I.F. No. 1 crew who produced the family’s remarkable photograph album with photographs and print records of his grandfather at the Royal Henley Peace Regatta. I hadn’t seen many of the photos before. We pored over the album on his kitchen table, drank tea, ate sandwiches and just yarned about this and that. The family couldn’t have been more generous and hospitable. The grandson showed me a Royal Henley Peace Regatta medallion won for the King’s Cup, still in its red velvet case, and an Inter-Allied Peace Games medallion organised by the Americans in Paris. I was even shown a pair of leather boxing gloves his grandfather has used when he won an inter-brigade boxing competition during the war. 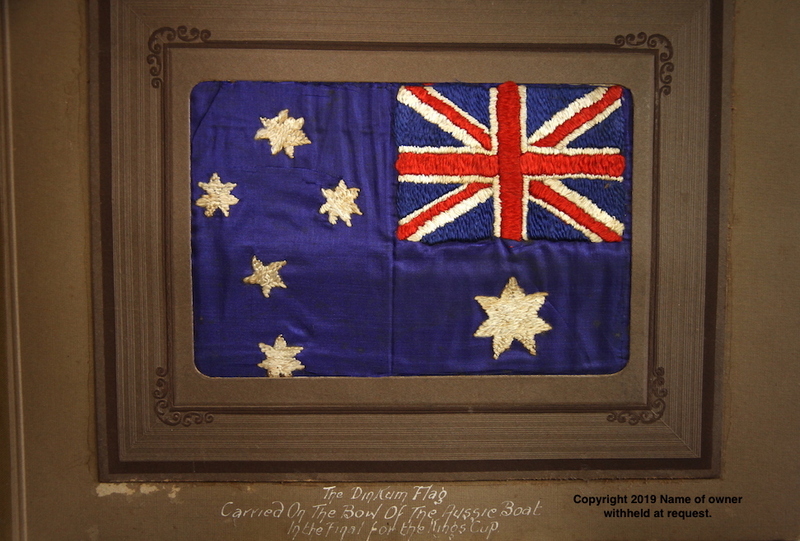 But inside the photo-album was a small, handwoven Australian flag, about five inches by seven inches, with the label, “The Dinkum Aussie Flag Carried on the bow of the Aussie Boat in the fight for King’s Cup.” I had seen many photographs of the A.I.F. No. 1 crew at training and even from the Peace Regatta Finals Day on Saturday 5 July 1919, and not once had I seen a flag flown from the bow of the Australian boat. I delicately told the grandson that perhaps the crew had intended to use the flag but maybe they didn’t go through with it. Maybe they were concerned that if it flew off mid-race, it may get caught in a slide perhaps? Basically, I was talking through my hat. After scanning and photographing the photograph album, I took my leave and continued with my research. For the documentary, I am hoping to film a recreation of the A.I.F. No. 1 crew in action rowing on the water. We are building poppet riggers for an old timber eight (not quite from 1919 but old); we will recreate the original Australian rowing kit with the A.I.F. Rising Sun emblem; and we are incredibly fortunate in having a master oar maker crafting eight oars, made from a recently discovered trove of precious Canadian spruce, to the exact specifications as those actually used by the Australians in 1919. In order to confirm the design of the blades, I started to examine a higher resolution photograph from the newly acquired photo of the A.I.F. No. 1 crew on the water at Henley. The photograph was a much wider angle than the previously cropped version I had seen and I used the ‘magnify tool’ to inspect the oars. Then as I roamed about the photograph in detail, checking out faces, poppets, the background names of local Henley boatbuilders on the opposite riverbank, I stopped. What I thought was a reflection was something that looked like a flag. But not where the bow-ball would be (though they didn’t use one in those days) but just in front of the sneak. With slower shutter speeds in those days, things that fluttered could easily be blurred, but the tell-tale Australian (and New Zealand) symbol stood out – the Southern Cross. The actual “Dinkum Aussie Flag” in the family photograph album. I quickly made a phone call to the family and told them that indeed they did have the ‘Dinkum Aussie Flag’ and that it did fly on the bow of the A.I.F. No. 1 boat in the King’s Cup. What an incredible artifact to be still in existence – 100 hundred years later. That this was the ‘Dinkum Aussie Flag’ that had led the way and crossed the finish line at Henley proudly fluttering before the crew themselves crossed. The ‘Dinkum Aussie Flag’ is probably one of the great pieces of Australian rowing memorabilia. It was commissioned by the crew and affixed in pride of place on their boat. They had followed the Australian Flag into war and after four years of carnage, horror and loss, they had followed the flag out the other side. Truly a rare Australian sporting artifact. You’ll have to wait for the documentary to know more about the story.